Abgründigkeit/ Anschauung/ Anblick [flanieren]/ Anstoss/ Arbeit/ Auflösung/ Bemerkung/ etc. Watch the complete piece on wandelweiser web tv. A 7-min trailer is here. 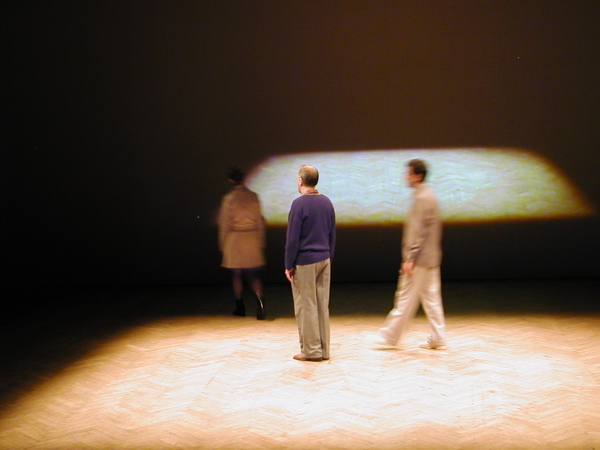 The piece consists solely in "naturally going" over a "performance area (the stage, the place, the location)". The paths always go from right to left. Some of the motions go with vocal actions - speaking or singing -, some go with portable instruments like clarinet or trumpet. Most of them are silent. 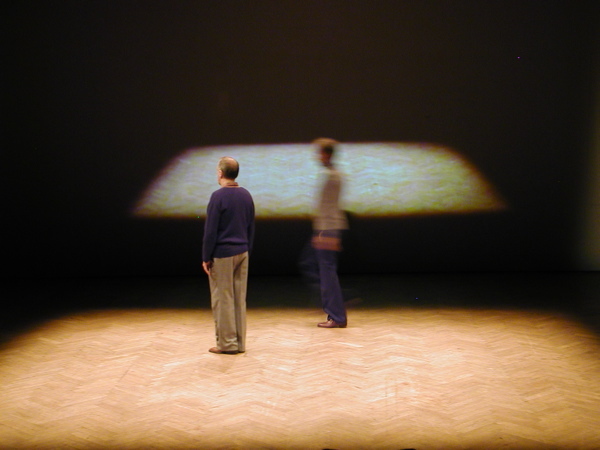 Each motion - an action of going - has a title, mostly a noun, which Frey found by wandering intentionlessly over texts by Fernando Pessoa, Robert Walser or Franz Kafka, e.g. : "abyssness", "base", "beautiful eyes", "clearance", "condition", "consistency","days", "description", "doze phantasy", "foreshadow", "half", "I'd", "impreciseness", "objection", "occasion", "resonance", "sunshine", "traces", "twenty days". These titles give a special "aroma" to each motion. There can be made any selection out of this catalogue of actions. Actions may overlap. 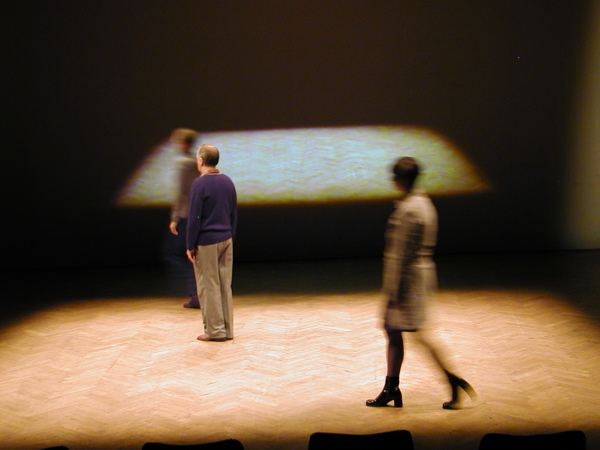 The title of a performance is the list of all titles of all chosen motions. Independent from the actions, there is a score for designing light and shadow. 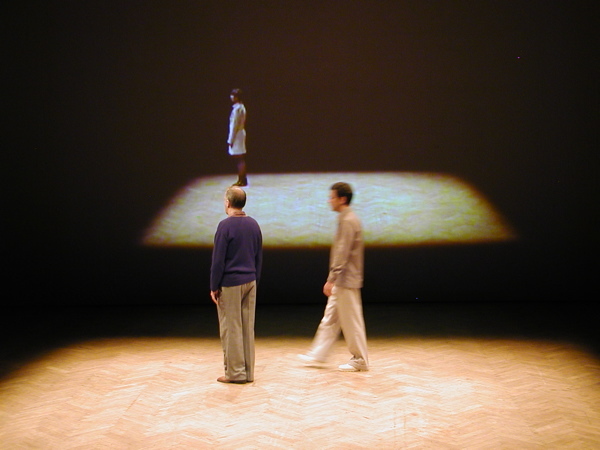 A selection of actions are filmed before the performance, at the performance space, in exact that situation as in the live performance (different motions though). 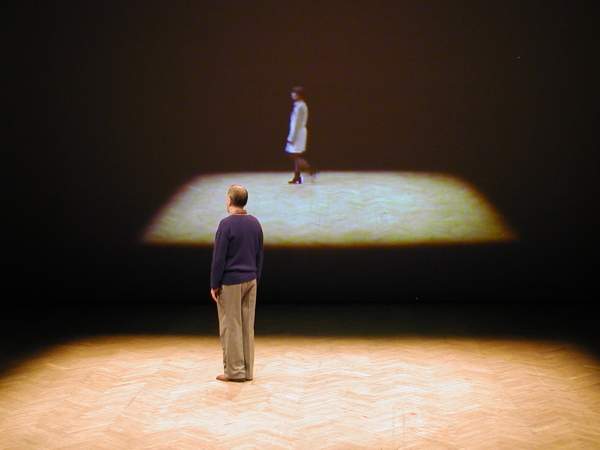 These are projected during the performance. Location and size of projection are free to be chosen. Jürg Frey wrote this piece for the Maulwerker ensemble.